My hands dry out and can crack like the bed of a river in a drought when the weather is cold or wet and when I’ve had my hands in climbing chalk. 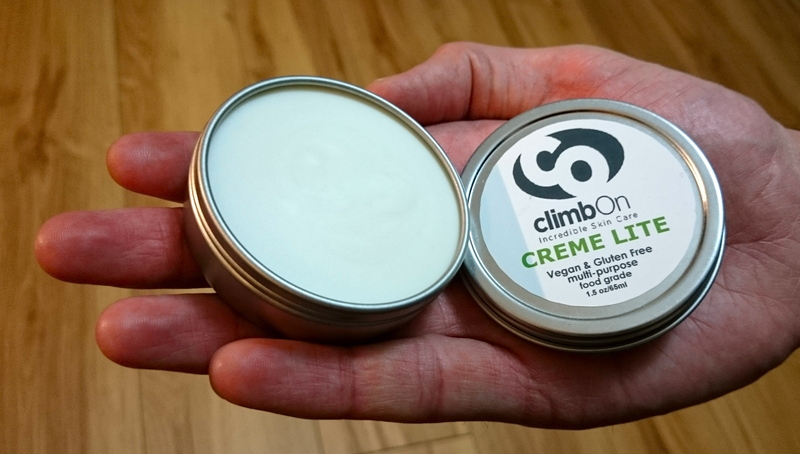 This means I’ve taken an interest in the balms and moisturisers designed to keep a rock climber’s hands in good condition and reviewed a few of them before. 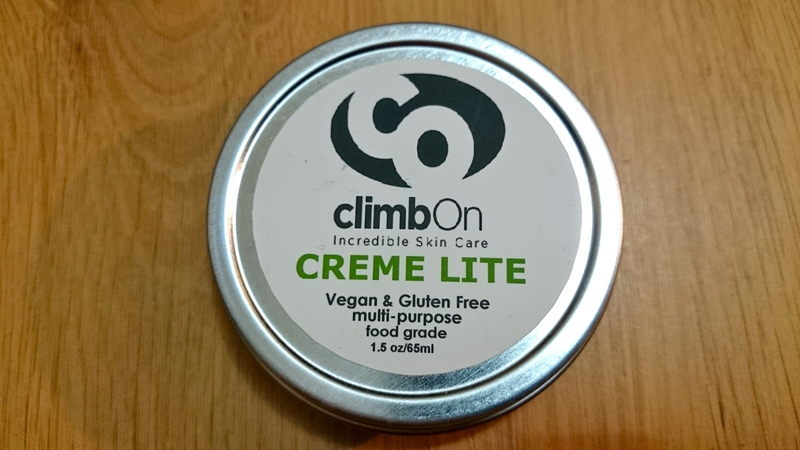 Recently I’ve been trying out the Climb On Adventure Bar and Climb On Crème Lite, made by SKINourishment of Texas using natural and food grade ingredients. Ingredients: Cera alba (unrefined yellow beeswax), prunus armeniaca (apricot kernel oil), vitis vinifera (grapeseed oil), triticum vulgare (wheatgerm oil), essential oils of commiphora myrrha (myrrh), cedrus atlantica (cedarwood), citrus aurantifolia (lime), boswellia carterii (frankincense) and tocopherol (Vitamin E). 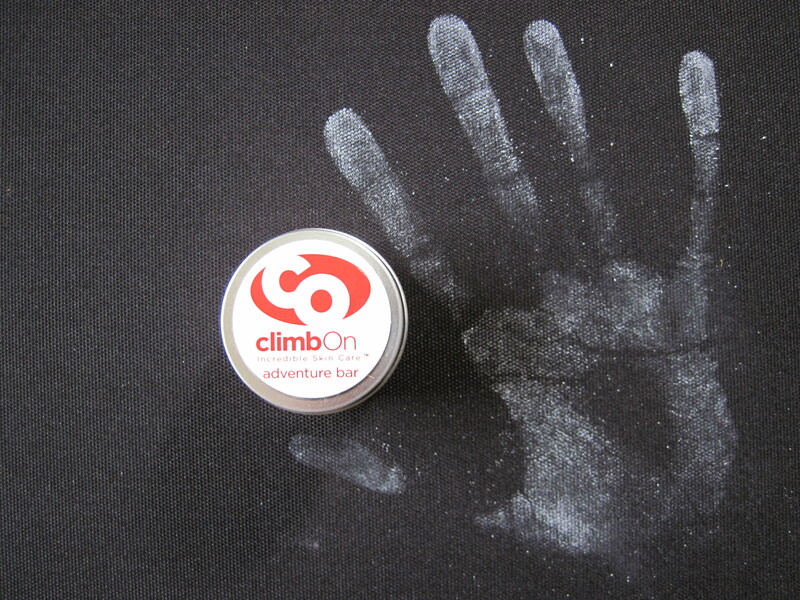 The Climb On Bar, Original has been one of my favourite hand balms and I gave it the top score in my original comparison of hand balms for rock climbers. I like it because it works well at moisturising and rejuvenating my hands and keeps my hands in good condition for the day. The Climb On Adventure Bar (called the Climb On Bar, Men in North America) does the same job, but slightly better. Like the Climb On, Original, SKINourishment state that the Adventure Bar is a multi-purpose product that can be used for any skin issue that needs deep moisturising and nourishing. It was apparently made in response to a request for a Climb On bar with a more manly smell. I can’t say that I’ve ever found Climb On, Original to have a non-masculine smell and I’m not sure I’d describe Adventure Bar as smelling masculine as such. It’s got a fairly subtle smell and smells mild when compared to Climb On, Original. The ingredients of the Adventure Bar are not too dissimilar to those of the Climb On, Original. The Adventure Bar is, like Climb On, Original, based on beeswax. Beeswax is a humectant, which means that when applied to the skin it attracts moisture in the air, draws it into the skin and locks it in there so as to both treat dry skin and prevent skin drying out. It’s also said to be anti-inflammatory, anti-bacterial and anti-allergenic as well as being a germicidal antioxidant. Plus, beeswax is a source of Vitamin A, which is meant to be good for cell development. 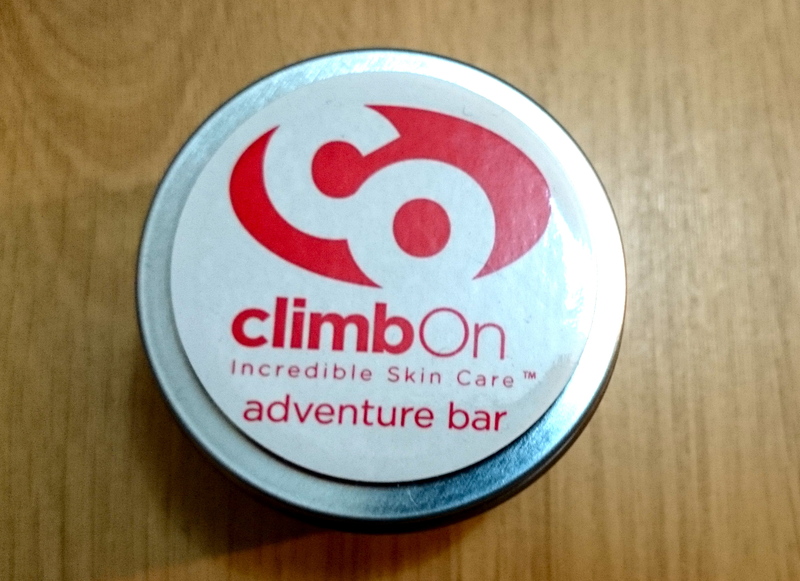 The differences are that the Adventure Bar contains lime and essential oils of myrrh, frankincense and cedarwood, but not the essential oils of lemon and lavender that are in Climb On, Original. Adventure Bar feels smoother in consistency and more solid than Climb On, Original. It still spreads easily and the waxy shine balms often leave goes quickly (possibly slightly more quickly than the Climb On, Original). It’s a good balm and certainly one of the best hand balms I’ve tried. Ingredients: organic, unrefined butryospermum parkii (shea butter), prunus armeniaca (apricot kernel oil), vitis vinifera (grape seed oil), essential oils of citrus lemon (lemon), citrus aurantium L. (neroli), lavendula angustifolia (lavender) and non-GMO tocopherol (Vitamin E). Crème Lite is meant to sit somewhere better the Climb On, Original bar and the Climb On Crème. The idea is that by cutting out the beeswax and aloe vera gel you get a crème that is lighter than its sister products but easily absorbed and just as effective. The primary ingredient of Crème Lite is shea butter, a fat derived from nuts that is used fairly extensively for its ability to moisturise and soften the skin. Shea butter also contains Vitamin A.
Crème Lite is set in a flat tin. It’s milky white and at first glance looks fairly solid. However, it readily melts under when you rub your fingertips over it and can then be very easily spread. Crème Lite does initially leave a shine when first applied, but this disappears quickly. Its smell is gentle and subtle. As it is a set in a tin, Crème Lite is slightly more labour intensive to apply to the hands than the balms that come in puck form like the Adventure Bar. 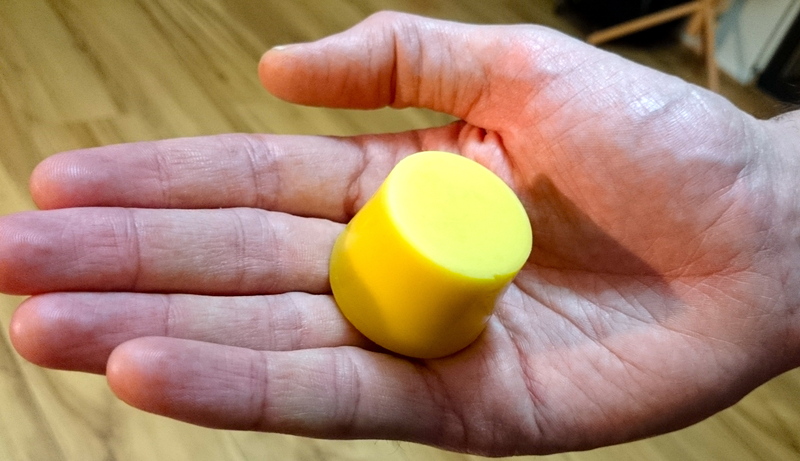 However, as the name suggests, it’s lighter than beeswax-based balms and this probably accounts for why it spreads so easily. It also means Crème Lite works better as a general-purpose moisturiser. I’ve used it on my hands, legs, feet and face and found that Crème Lite has done a good job of soothing and moisturising skin. It does linger on my face for a while in a way that a dedicated facial moisturiser is unlikely to, but not in a way that is clammy or cloying. Facial skin also varies so widely between people that someone else might find Crème Lite behaves differently for them. Although it initially works well at moisturising my hands, Crème Lite didn’t keep my hands moisturised through the course of the day as well as many of the hand balms I’ve tried. This means that it probably wouldn’t be my first choice for a hand care product to take with me on a day Gritstone climbing on a cold October day or for a long session at the climbing wall. I’d be far more likely to put the Adventure Bar in my rucksack in those circumstances. However, Crème Lite might well be my first choice if I wanted to take just one moisturiser with me on a weekend or longer trip. This is because it feels a bit more versatile as a skincare product than a dedicated hand balm. Years ago, on an overseas trip, I opened my rucksack to find that over-stuffing and a change of altitude had led a bottle of sunscreen to explode over my clothes. Since then I’ve been careful about how I pack bottles of sunscreen and moisturiser. Being lighter, smaller and more robust than a bottle or tube of moisturiser means that Crème Lite might be a much better (and potentially less messy) travel companion. Declaration: SKINourishment gave me a free sample of the Crème Lite and the Adventure Bar specifically for me to review. This hasn’t influenced my opinion. Climb On Adventure Bar works excellent. Every ingredient’s beneficial to your skin; UNBELIEVABLE. My son introduced me to this product after melanoma removal on my face. Justin recommended this to speed up healing process after 14 stitches were removed. That’s brilliant. It’s great that it worked so well in your recovery. My son Justin, resides in Mt. Shasta CA and is a serious rock climber. He uses this product routinely. Thanks James. It’s good to hear your thoughts on this and to know it works so well.